I am loving this holiday plaid Coach Tour dress from ModCloth! The cheery plaid is perfect for the holiday season and can be worn all winter. It is truly the perfect winter dress no matter where you live - It's a lightweight material, so it works wonderfully in warm climates, or, if you're like me and you live in the northeast or a colder climate, it's fantastic when layered with a long sleeve shirt and tights. I also have to say I find the dress to be very flattering. I actually purchased this dress last year when I was about 6 months postpartum and more on the fluffy side than I am now and it was still quite flattering. Add in a year of lifting up a baby and building my 'mom arms' up and I think it looks even better! I love this style and I may purchase this dress in a different pattern or with sleeves - in particular I am loving the Parisian feel of the navy stripe 3/4 sleeve version. My only wish is that they had also used stretchy stitching, because while the material is quite stretchy, the stitching is not and I definitely popped a few stitches getting it over my head! At first I was unsure of what to wear underneath this dress. It has a cowl neck, so I didn't want to wear a turtle neck and I also did not want the bulk of another layer to show underneath. I came across the Spanx Arm Tights on Rach Parcell's Instagram/Blog, but I wasn't sure if I wanted to invest. They aren't that expensive, only $30, but I wasn't sure how useful they would be or if I would find them comfortable. I mean, how often would I wear them? Needless to say I was *very* excited when I came across this great long sleeve crop top on Amazon for less than half the price, plus free two day shipping! Although I typically wear a small, I sized up to a medium in this top and it fit perfectly with quite a bit of stretch. I'm sure I'll this will become a staple in my winter wardrobe! I paired my dress with the Coco Crossbody from Mali + Lili, stockings from Calzedonia (similar), and my ankle boots from Dansko (similar - on sale!) 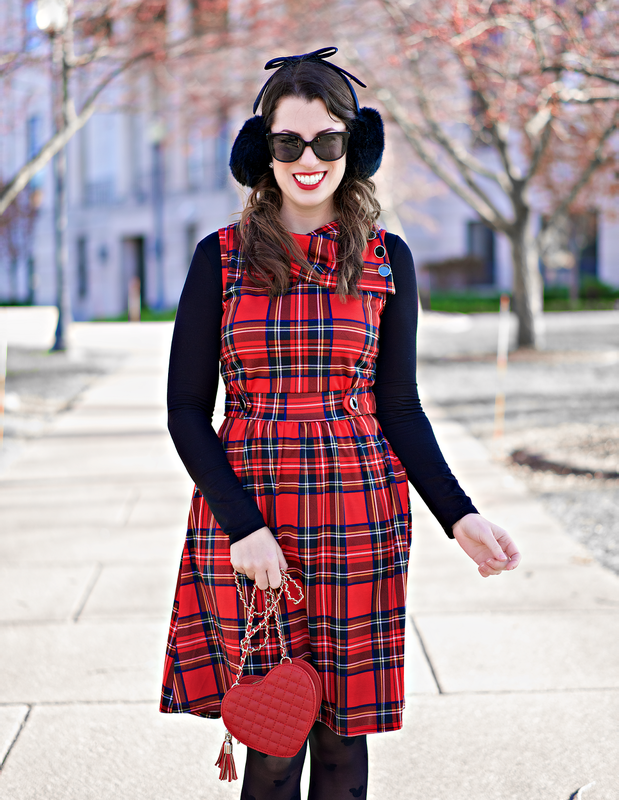 and Kate Spade earmuffs (updated design).